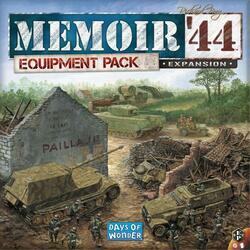 Welcome to the Memoir' 44 Equipment Pack - never before has an expansion of the game contained so many figures! On D-Day, Allied forces landed more than 150,000 soldiers and thousands of tons of various equipment on the beaches of Normandy. 68 years to the day after this historic event, Days of Wonder is offering this major expansion for the Memoir' 44 game system in a box as big as the base game and containing 186 plastic miniatures. These 186 miniatures and accessories can be used on many existing scenarios, but are particularly highlighted in the scenarios proposed by the expansion: 11 standard scenarios, 2 Breakthrough and 4 Overlord. A rule booklet and 25 summary cards are also provided in it.